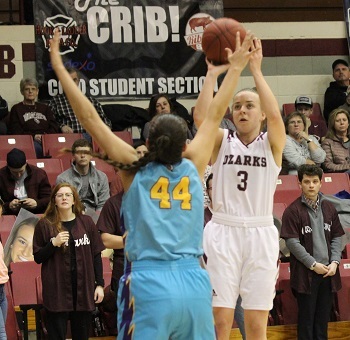 College of the Ozarks Lady Bobcats hosted A.I.I. conference foe Haskell Indian Nations University on Saturday afternoon and posted an 75-61 victory. The two teams opened the game by basically trading baskets. 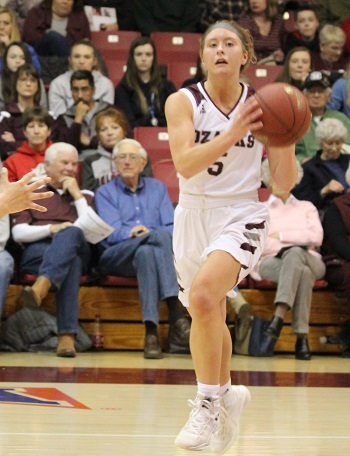 The score was tied twice, and the Lady Cats’ greatest lead was five points at the 25-second mark of the first quarter, before CofO closed out the quarter with a 17-13 advantage. Cass Johnson hit three treys for the Lady Cats to lead all scorers after one. In the second quarter, CofO put together an 8-0 to take a 12-point lead (25-13). The Indians battled back to trail by only six at the half (31-25) as the two teams headed to the locker room. Neither team shot exceptionally well in the first half, with CofO going 12-32 (37.5%) and Haskell hitting 10-30 (33.3%). The Lady Cats turned the ball over six times, compared to nine by Haskell. The Indians held the edge in rebounds, collecting 21 versus CofO at 19. The Lady Cats put up six treys in the half, with Haskell sinking only three. The third quarter sparked some excitement for the Lady Cats, as they opened up with a 5-0 run to extend their lead to 13. Shortly thereafter, Kelsie Cleeton nabbed a steal from Haskell’s Tia Woods and dished the ball to Cass Johnson, who drained another 3-ball. Cleeton’s assist to Johnson featured her 470th career assist-- the one needed to move her into the number one spot in the Lady Bobcats’ record book for All-time Assists. CofO continued to dominate the third quarter, taking a 23-point lead with 2:49 to play, until the Indians fought back with a 9-2 run. For the quarter, the Lad Cats outscored the Indians 28-18 to close out the third period with CofO on top, 59-43. In the final quarter, the Lady Cats again pushed their lead to 21 points before Haskell posted a 9-2 stretch for a final score of 75-61. 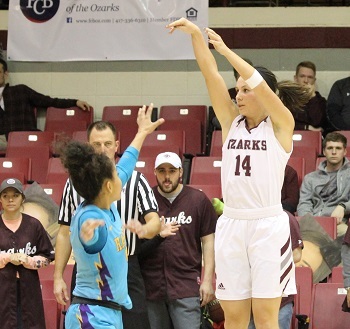 Both teams improved their shooting in the second half, as Haskell made 15-33 (45.5%) from the field and CofO drained 16-31 (51.6%), including five treys. The Lady Cats also stepped up their rebounding in the half, pulling down 23 rebounds to Haskell’s 11. Leading the Lady Cats in scoring was Cass Johnson with a game-leading 24 points, featuring seven three-pointers, followed closely by Abby Oliver with 22. Kelsie Cleeton posted her 16th double-double of the season, leading all rebounders with 15 and scoring 12. Cleeton just missed another triple-double, as she posted a game-leading nine assists and added seven steals. Cleeton’s record-breaking performance was her second of the season. The first came on January 15, 2019, when Cleeton’s eight rebounds in a game versus Columbia College placed her as the new Lady Bobcat record holder for career rebounds. The All-Time Rebounding record was previously held for 28 years by Stacey Fritts Kimberling (1987-1991), with a total of 1,134. The All-Time Assist record was previously held by Kayla Kepler Daniels (2011-2015) with a total of 469 assists.